According to the Guinness Book of World Records, standing only 6.5 inches tall, I-Sobot is the world’s smallest mass produced humanoid robot. I-Sobot is equipped with 17 miniature servo motors and a set of gyro's for precise stabilization and balance. It is made by the Tomy Company who started in the 80's with the Omnibot series of robots such as the Omnibot 2000. The 12 oz, 6.5" high programmable humanoid can walk, play air guitar, dance the hula, and perform 200 other moves. He can be controlled via the included remote control or simple voice commands. I-Sobot even graced the front cover of "Robot" Magazine and has since become a favorite of robotic collectors worldwide. The remote control has an integrated LCD screen. It allows I-Sobot the ability to perform from a vast array of built in programs or you can create your own moves which can be stored and re-played again & again. I-Sobot comes in two different colors/versions. The Black & White one (above) is programmed to listen and talk in English and the Blue & White one speaks and understands Japanese. Because of his onboard systems, I-Sobot can do some remarkable moves. He can even balance on one leg as shown in the picture at right. 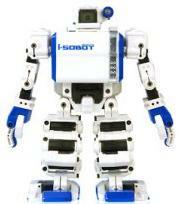 I-Sobot runs for about an hour on the included rechargeable batteries. I-Sobot is copyrighted by the Tomy Corporation.